You are sure to find your keys with either of these key chains. Easy to hang and attractive in presence. Bead colors will vary. 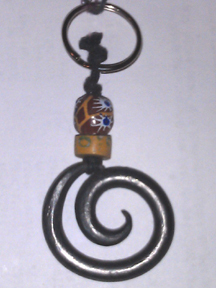 Forged steel Spiral or Heart are approximately 2" in size. Heart Key Chain is not shown but is the same heart as the necklaces we offer. Crafted by Sarahzona Designs in Camp Verde Arizona.